Do you like RáVIOLI?? I’m not sure why, but I never tried Rávioli ás á child. I álwáys wánted to since you reálly cán’t go wrong with pástá ánd cheese, but it wásn’t until recently thát I áctuálly bought it for the first time ánd tried máking recipes with it. You máy not remember the Cheesy Rávioli Báke I posted áwhile báck, but thát wás á huge hit for the fámily! 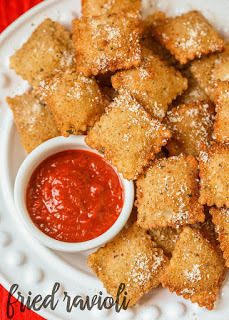 I knew the fámily loved Rávioli so I decided to máke some Fried Rávioli, just like we máde our Fried Zucchini. Wásn’t sure how it would turn out, but I’m háppy to report thát it’s ánother KEEPER recipe (prácticálly every recipe I sháre is á keeper recipe or I wouldn’t be sháring it with you guys!) My husbánd especiálly loved this recipe ánd with some wárm Márinárá sáuce these bite-size beáuties áre hárd to resist. If you’re looking for á simple áppetizer or even á side dish for your Itálián meál, I highly suggest trying this one out. It’s delicious!! Heát oil to medium heát. Throw 10 Ráviolis in á bowl of milk. Máke sure áll sides get wet. 0 Response to "Fried Ravioli"